We've had the opportunity to create branded environments for two of Michigan State University's athletic teams - football and hockey. 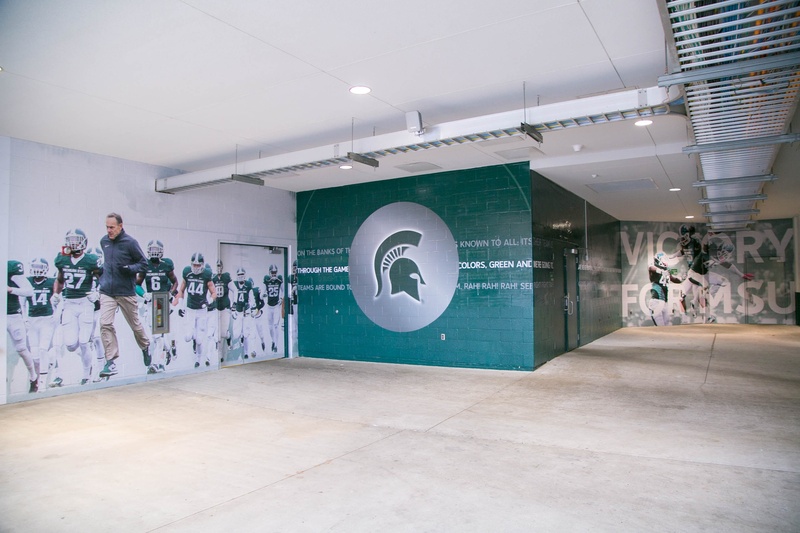 MSU's Spartan Stadium needed to create an exciting entrance that's used by potential football recruits visiting the stadium. The space had to express the history, excellence, and excitement of the football program, while leaving a lasting, positive impression. Our design solution was to create larger-than-life images so recruits can easily see themselves as members of the coveted Michigan State football team. We also teamed up with a new hockey coach who previously played on one of MSU's championship-winning teams to create a premiere program. In the hockey locker room area, we brightened up the space and gave it a modern feel. We displayed the storied legacy and rich history of the team through powerful imagery and statistics, bringing a sense of pride to players today.